Kris Biagiotti's whole body shook as the two bombs went off at the Boston Marathon finish line last year. She was one of 27,000 runners that day but her journey was different: She was pushing Kayla, her 18-year-old special-needs daughter. "It was so loud, like I had never heard anything that loud and it was like, it just felt like it picked you up and moved you," she said of the bombs that exploded just feet from where she was running. Her brother, Richard Biagiotti, and her fiancé, Brian Bridges, joined her to run the last half-mile and they, too, felt the intense pressure of the bombs. It was "like a stick of dynamite going off right next to your head," Bridges said. One image of that day sticks in his mind: The flags near the finish line were erect; the pressure of the bomb blew them so hard that it was as if they were going to tear off of the sturdy flagpoles. 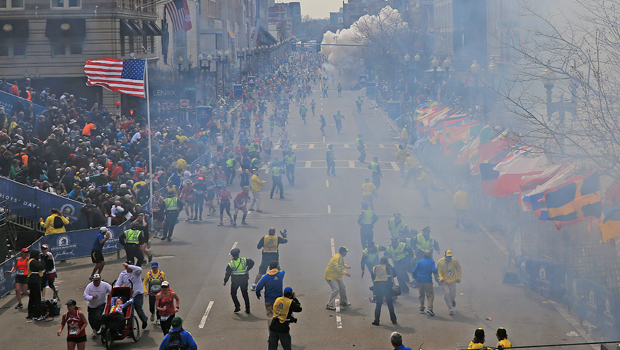 After the explosions, Bridges rushed to grab the jogging stroller and Kris Biagiotti saw blood running down his face. His ear had been hit by pieces from the bomb. Bridges and Kris Biagiotti ran to the medical tent - while Kayla and Richard Biagiotti went to meet their friends - but as soon as they saw the severity of others' injuries, they left with gauze on his ear and headed to a hospital. Bridges needed 10 stitches and his ears buzzed for a few days but, today, his hearing is back to normal. Compared to others that day - three spectators were killed and 16 people lost one or more limbs - they know they were lucky. Kris and Kayla Biagiotti were the second to last runners to cross the finish line and the first mother-daughter team ever to run the Boston Marathon with a jogging stroller. "It was a big accomplishment for us," Kris Biagiotti said. She had trained tirelessly for that day for two years. "It was, you know, go out and run 15 or 16 miles and then come home and I would get Kayla's jogging stroller and put 100 pounds of rock salt in it and go out and do hills," she said. She would also run a mile on a treadmill, get off and do 100 pushups. Then, she would repeat the grueling workout five or six times. Her goal was to build up her upper body strength as she built up her endurance. Her main fear was not running up the marathon's Heartbreak Hill, but rather running down Heartbreak Hill, having to grip and control the jogging stroller, which weighed a total of 145 pounds with her daughter in it. But the preparations didn't stop when they lined up at the start line in Hopkinton, Mass., last year on April 15. "I had to strategically plan and map out my timeline," Biagiotti said. "I had nursing support along the course so that Kayla could get her medications. I hooked her up to her feeding tubes before we started the marathon and then at strategic points we stopped along the way." During the training Kayla's body rocked with excitement when it was time for her to get out of her wheelchair and go for runs in the jogging stroller. On the day of the marathon her adrenaline was at an all-time high. "She felt like a rock star," her mother said. Throughout the run, Kayla's arms were electric, jubilantly flying into the air as fans gave her high-fives and yelled, "Go K-Girls!" That afternoon, despite the horrific ending to the race, all of their fans celebrated the achievement. And Biagiotti said it was that positive attitude that helped them to move forward. Kayla still doesn't know that two bombs went off at the finish line. She thinks it was all part of the celebration. Her mother wants to keep it that way. In the past year, Kayla graduated from high school and attended two proms. Biagiotti is back to training for the Boston Marathon and, for safety reasons, this year she won't push her daughter. Looking forward to marathon day, her only worry is that it will be hard to run through tears. "My biggest fear is that it is going to be extremely emotional," she said as her eyes glossed over with sadness. "I know that it is going to be difficult at times to run." But running over the finish line this year will be part of the healing process for her. And, at 47, she doesn't plan to stop running anytime soon.